Henry Holt and Co. (BYR), 9780805096750, 336pp. 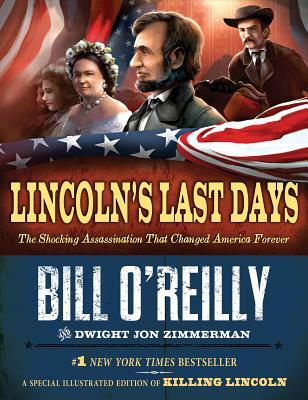 Lincoln's Last Days is a gripping account of one of the most dramatic nights in American history—of how one gunshot changed the country forever. Adapted from Bill O'Reilly's bestselling historical thriller, Killing Lincoln, this book will have young readers—and grown-ups too—hooked on history. In the spring of 1865, President Abraham Lincoln travels through Washington, D.C., after finally winning America's bloody Civil War. In the midst of celebrations, Lincoln is assassinated at Ford's Theatre by a famous actor named John Wilkes Booth. What follows is a thrilling chase, ending with a fiery shoot-out and swift justice for the perpetrators. With an unforgettable cast of characters, page-turning action, vivid detail, and art on every spread, Lincoln's Last Days is history that reads like a thriller. This is a very special book, irresistible on its own or as a compelling companion to Killing Lincoln. DWIGHT JON ZIMMERMAN has written extensively on military-history subjects for American Heritage, the Naval Institute Press, Vietnam Magazine, and numerous military-themed publications. His books include The Hammer and the Anvil and The Vietnam War: A Graphic History. He lives in Brooklyn, New York.